This should be an interesting year when Spring comes. Good stuff loki100! Looks very good - I'm waiting for the other shoe to drop. Side-stepping the David Cameron reference: what does that negotiation do for you? Does it impact the intervention level? And how does that work? Is there an arbitrary limit after which the French come wading ashore, or do higher numbers lead to higher probability of intervention? Curious to know how well you can predict the remainder of the happy days until the cheese-eating surrender monkeys start mucking up your 'Pacification for Proper Taxation' campaign. Field Marshal Hotzendorf wrote: This should be an interesting year when Spring comes. Good stuff loki100! Stuyvesant wrote: Looks very good - I'm waiting for the other shoe to drop. 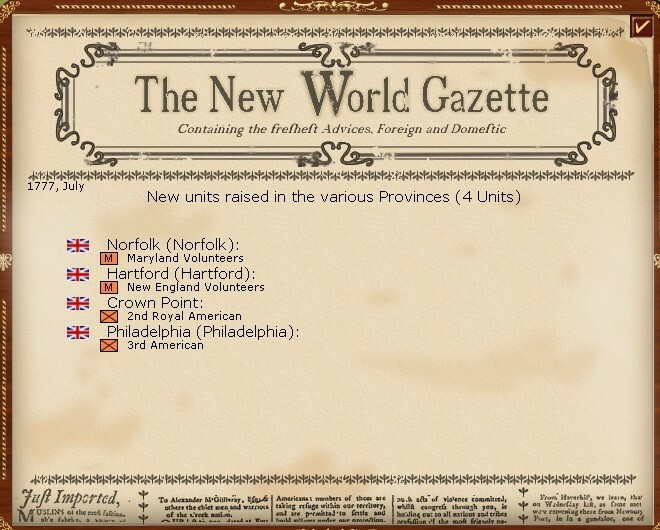 I'm not sure, I've seen messages where the tax evaders have sent begging letters to the French and the intervention level has shifted as the war progresses - it went up when I lost Boston and came down when I took Philadelphia. 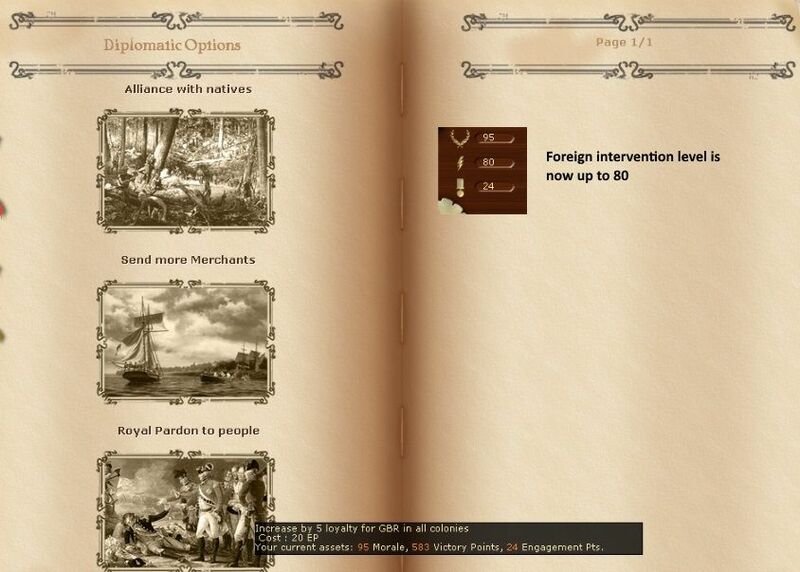 Having said that, I think French intervention will happen at some stage from 1778 as will the Spanish war from 1779. Not the most useful units but I have masses of militia replacements so I can be a bit more aggressive with these than my British/German regulars. Had forgotten about this – another army turns up. 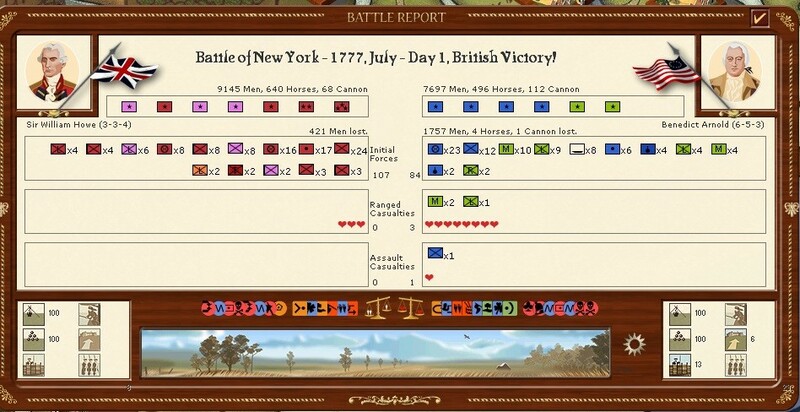 I think I didn't see this in my game with Narwhal as he'd already beaten me in 1776. So that is a nice reinforcement for my hordes around Philadelphia. For the first time 'Earl' Grey fails me, being beaten off by Mr Greene. A brief reviving cup of tea later he is more than ready to do the business. 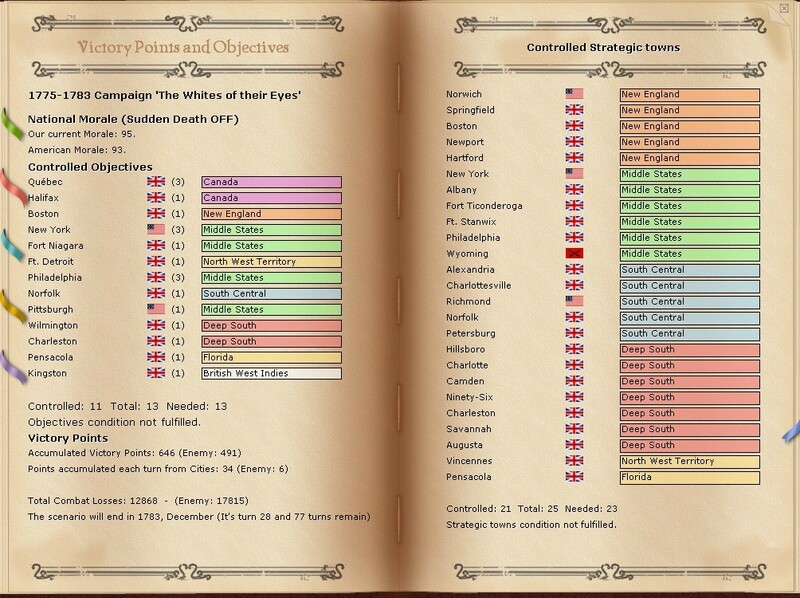 That defeat, and losses in the pursuit, completely finished off Mr Greene's army. Goes someway to compensating for my lost army at Boston. Even better I captured three supply wagons. That will help a lot in the coming campaigns. Also Sir Charles gets a well deserved promotion. 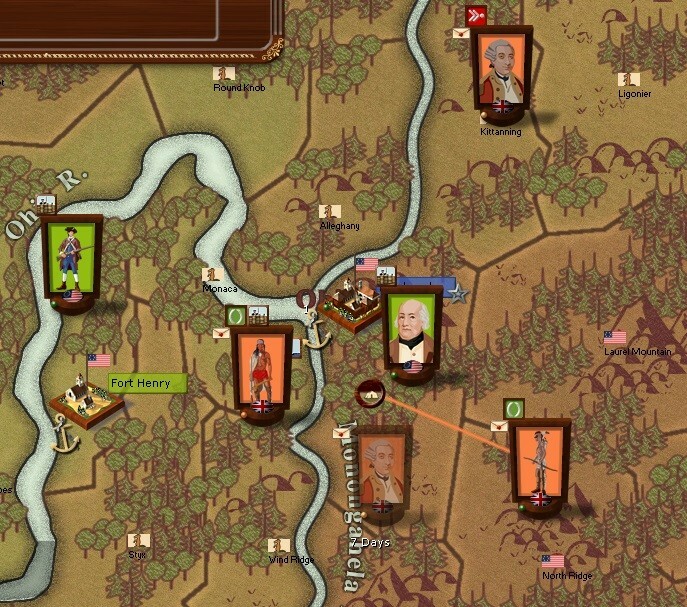 William Erskine proved to be made of weaker stuff – this is connected to trying to defeat an American army hanging around to the west of Philadelphia, you can see it in the above screenshot menacing my loyal city of Lancaster – note also the Americans are now reduced to congressing in York. I'll capture that at some stage. I've broken up my army in that region into lots of smaller formations and am gambling on the green stance. Each fort is also held by a separate force so I don't lose control just if I am pushed out by a sneaky American attack. That last battle against Greene was impressive. What was the deciding factor there for 'Earl' Grey to win such a one sided victory? Was it the fact Greene had no cannon? Field Marshal Hotzendorf wrote: That last battle against Greene was impressive. What was the deciding factor there for 'Earl' Grey to win such a one sided victory? Was it the fact Greene had no cannon? I actually think it was the first battle that was the odd one out. That must have been the fourth turn in a row that Mr Greene has had a bad day at the office. 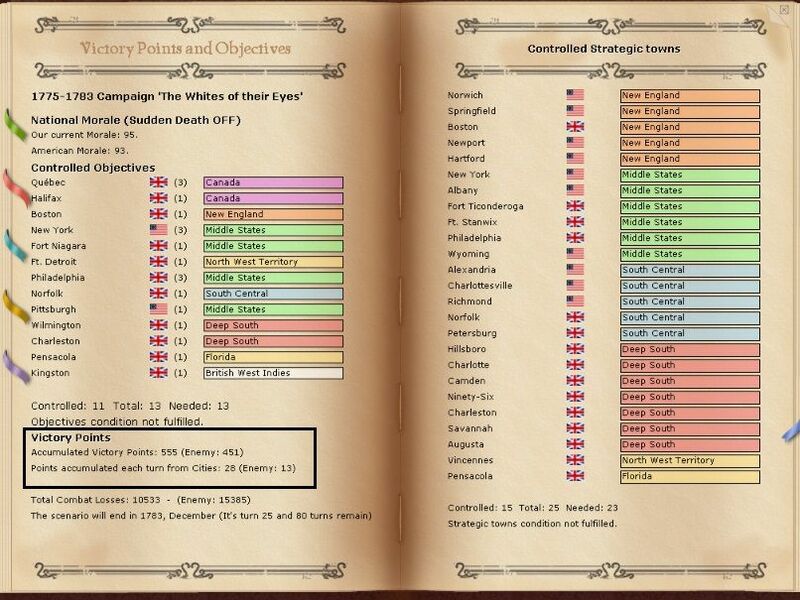 Looking at the combat results, it looks like all the luck went their way on the first day (the little scales in the centre between all the trait/stance data). My instinct is they were very low on cohesion and probably had a lot of partially damaged elements (4-5 lost battles and being forced to march/retreat in the snow), so 2 battles back to back was too much for them and the army just fell apart. You can see the advantage of even my limited artillery in the heavy losses they took in the ranged phase but I don't think any army in WiA has the sort of artillery numbers to be really decisive, its just a useful addition to your overall combat power. That seems to happen in WiA, I've had armies have severe beatings but not lose elements, but over time they weaken to the point of major collapse. I'd sent a very small force to cover New York, however this ran into Washington. Clearly the Americans have no intention of spending a pleasant summer up at Albany. However, that they lost a militia element in such a one-sided battle is good news ... indicates that lack of supply has prevented them really recovering their strength over winter. So the war now has split into two blocks. First the Americans still hold a cluster of cities in Virginia. The northern one (Alexandria) should be relatively easy for me to take with a formation detached from the main armies around Philadelphia. 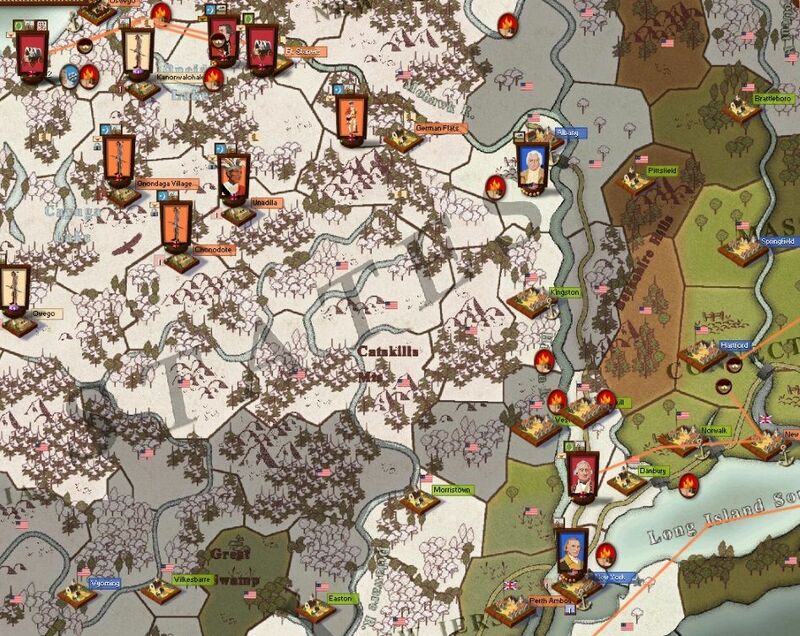 The cluster of Richmond-Charlottesburg is much harder as that is quite a powerful American units and the road net/rivers do not make it easy to attack. The ship movement you can see is some reinforcements being sent down from Boston. Also a number of formations are being moved up from the Deep South. And here is the Hudson. Clearly Arnold survived his winter walk but I suspect his army is a bit of a mess. Vigabrand is now well placed to resupply and has a central position. I'm going to bring down some formations from New England to create a buffer to the north-east. 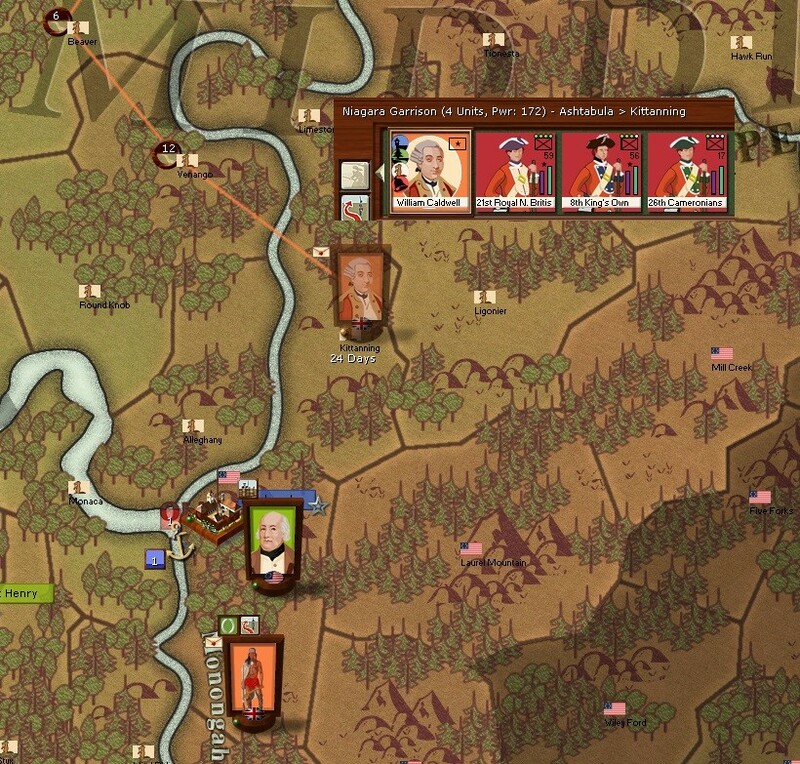 I'm juggling units and supply along the Mohawk but I think I can create a powerful enough army to both dislodge Arnold and create an expedition to go and capture Pittsburgh – which sits off in the wilderness in the way that key fort did in the French and Indian wars. At worst, I'm building up a small lead in victory points. Invaluable once the French intervene and the war starts to turn against me. What's Foreign Entry at now? Altaris wrote: What's Foreign Entry at now? So very unlikely you can win an Objective win then... New York and Pittsburg appear to be out of reach. Might as well start figuring out where you can dig in! If you can cover the southern ports up to Philadelphia, or at least Richmond, you can make the South fairly hard to crack. The French have the same problem you've had the whole war... supply bases. If you can keep the harbors out of their control, and have a good defensive barrier at the northernmost edge of your dug-in line, that's probably your best holding move. 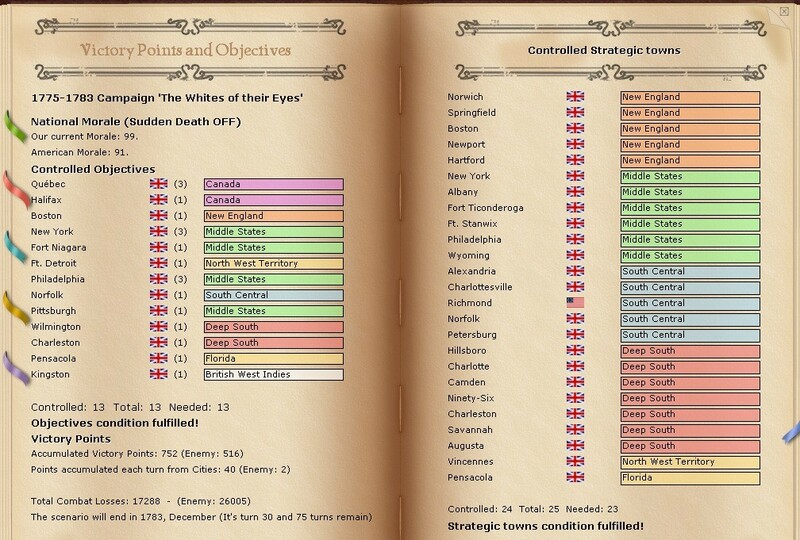 But yeah, it's tough to win with the British once the rest of Europe starts to show up. The French are bad enough, but once the Spanish and Dutch dog-pile in, your days of flexibility are over. 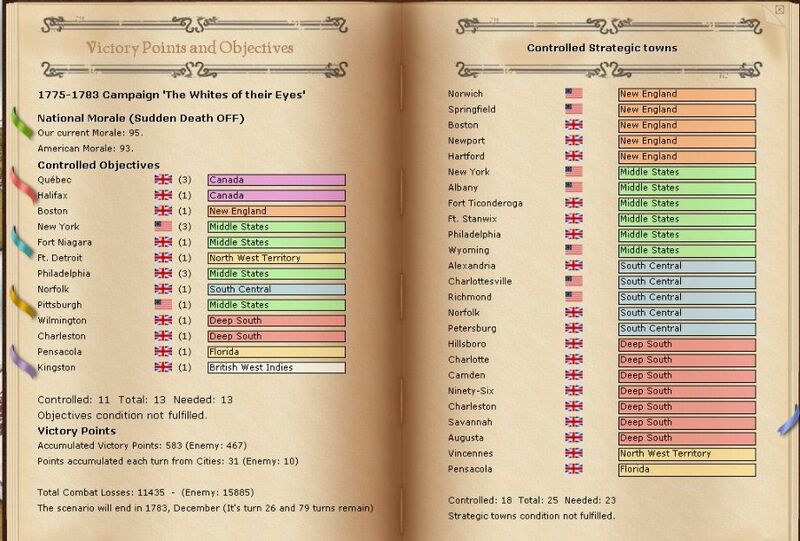 Altaris wrote: So very unlikely you can win an Objective win then... New York and Pittsburg appear to be out of reach. Might as well start figuring out where you can dig in! If you can cover the southern ports up to Philadelphia, or at least Richmond, you can make the South fairly hard to crack. The French have the same problem you've had the whole war... supply bases. If you can keep the harbors out of their control, and have a good defensive barrier at the northernmost edge of your dug-in line, that's probably your best holding move. But yeah, it's tough to win with the British once the rest of Europe starts to show up. The French are bad enough, but once the Spanish and Dutch dog-pile in, your days of flexibility are over. 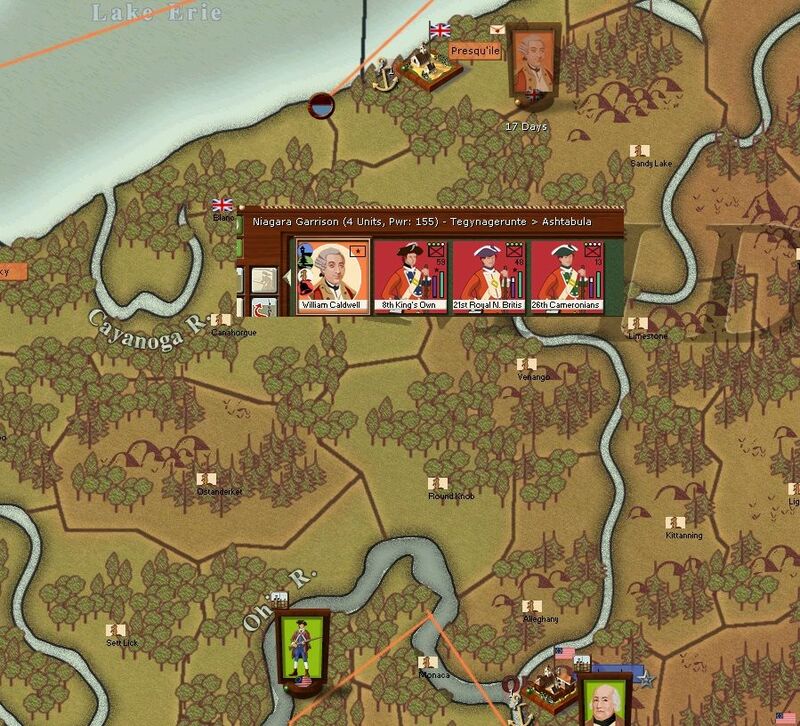 oddly I am more optimistic about taking Pittsburgh, I've scouted it with some friendly Indians and it looks like he hasn't reinforced it - so the defense is only a few militia battalions. In that case a decent brigade should be able to quickly take the place and will be hard for him to retake. Agree about the rest, I'm currently grabbing almost every port I can in order to wreck the American navy. But when the French arrive I want to run down their at start supply by making them have to siege to gain a toehold. One thing in this game is even if you have just about enough supply to avoid outright disaster, its very hard to recover lost supply. 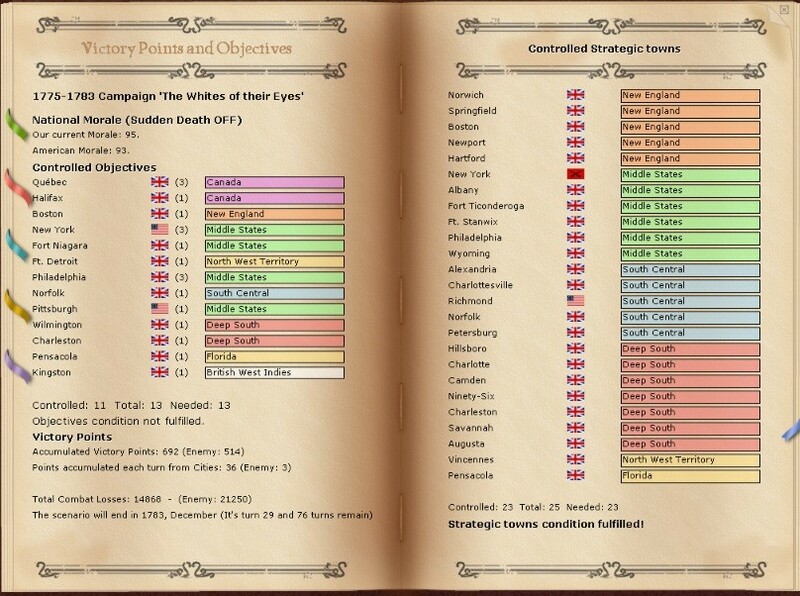 The opening event for May was a surprise as a huge horde of Americans came swooping out of the west and attacked one of my totally innocent Indian villages. This was not actually good news for the Americans as I now have even more Indians to play with. Better news for me was on the coast where I took the last American port in the south, Georgetown, and captured some more boats. On the Mohawk, Benedict clearly is out for revenge. So here's the south after all that drama. I decide its a good idea to hit the American brigade again and to send another brigade to reinforce Ninety-Six. My new Indian chums are sent off inland to find things to burn down. Around Philadelphia, the main issue is that still powerful American army at Lancaster. For the moment, I'm in no hurry to fight it (being more worried about Washington) and it is not very mobile. 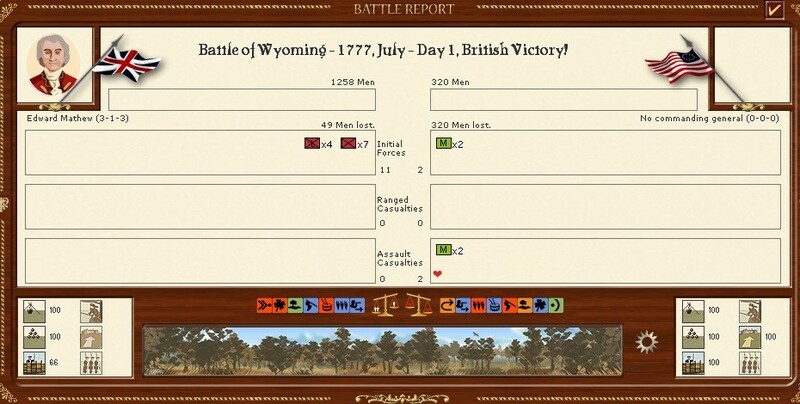 I guess that Lancaster is just big enough for supply so I decide to bypass it with a small brigade and capture Wyoming. The bulk of the army stays put and re-organises into a single large stack. Note that my approach of breaking down over winter has paid off as my main units are at full strength (the little green dots). I also bring down the fleet to try and keep New York under naval blockade. On the Mohawk, plans are being laid. 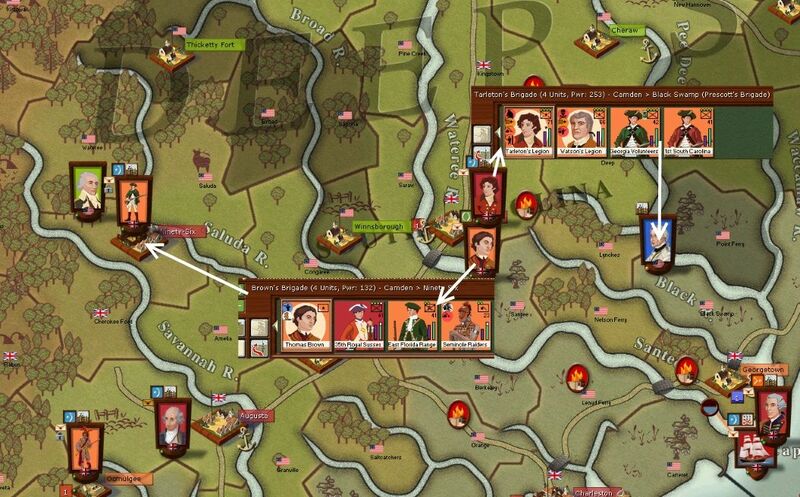 For the rest, I spend one more turn at Oswego regaining supply and replacements. In a strange moment of kindness, I offer the Americans the chance to surrender. 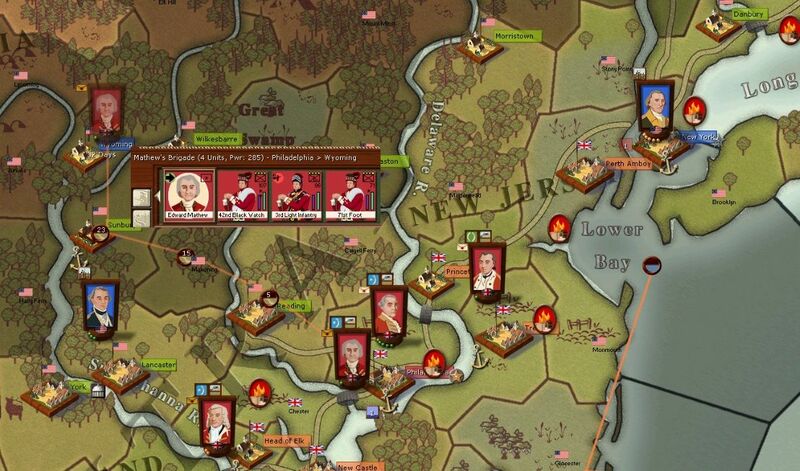 In addition, a small brigade is sent from Fort Triconderoga to Norwich (an objective city) and I split up my New England army to grab other key cities in the region. With a bit of luck by the end of the summer, I should have all New England, Pittsburgh and Wyoming. 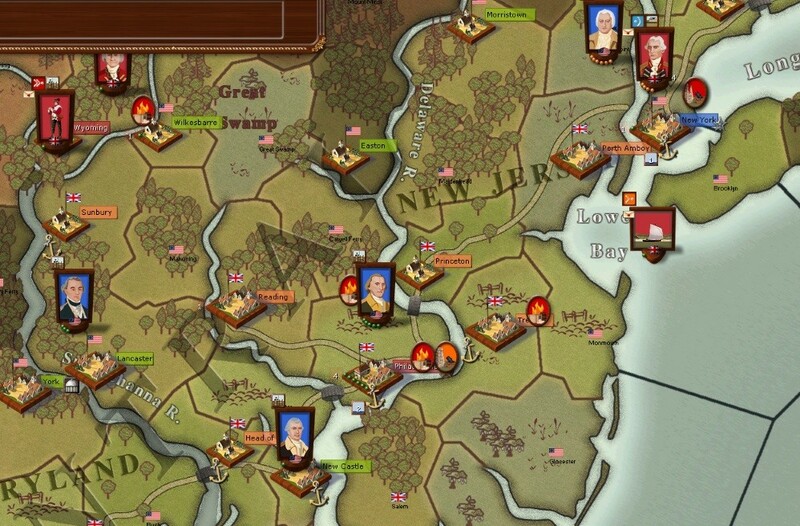 I don't think I can clear out Virginia and New York-Albany are well protected by the two main American armies. The 'American horde from the West' won a battle at Ninety Six but the arrival of my fresh formations meant they failed to hold the province. I'm trying to resolve the problem with Richmond. My idea is to send the southern force to capture Charlottesville, that might encourage the Americans to move away from Richmond (but I doubt they will as it is clearly a decent supply source). 'Earl' Grey waits to pounce if they do move. 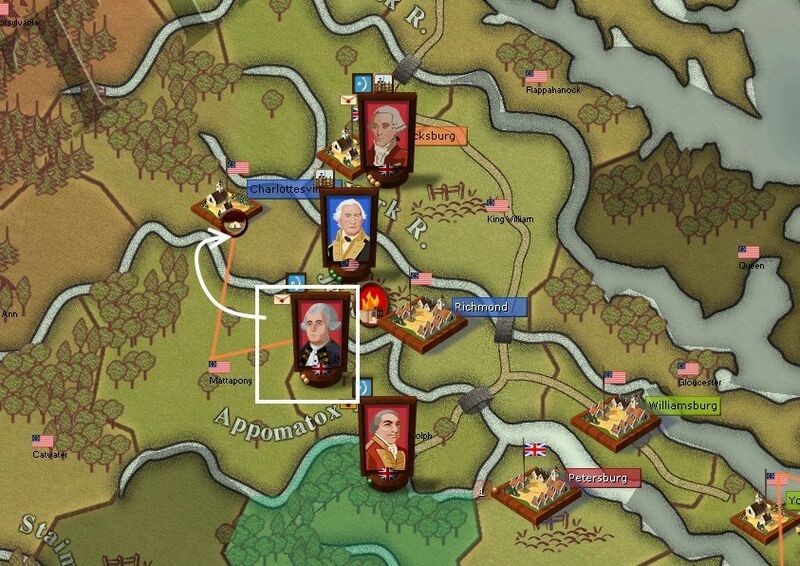 I decide to gamble on Washington's army being in a bit of mess for replacements and supply. So an army from Philadelphia and Howe from the north converge on New York. They will arrive a day apart (not much I can do about that) but having to fight two big battles in a few days may well cause Washington serious losses. Arnold is still at Albany and the main British/German army on the Mohawk is moving up. The vacation force heading to Pittsburgh makes progress. I'm moving it by relatively short marches so it doesn't lose too much cohesion on the way. 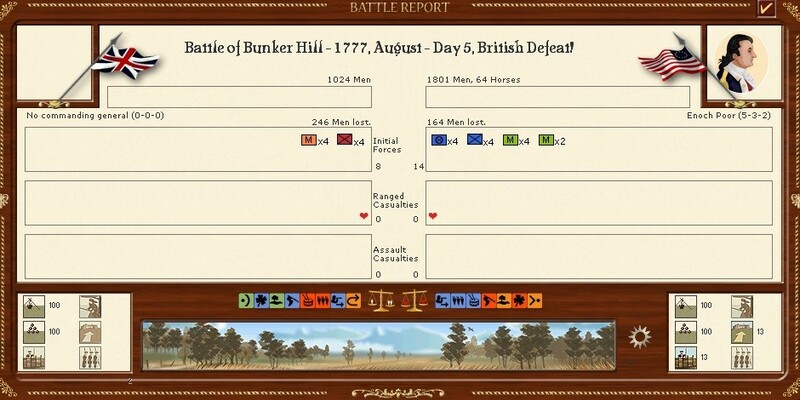 It looks like the Americans have not reinforced the at-start units here ... a mistake I think as a couple of regular battalions would make it nearly impossible to capture. Looking forward to the results of the battle against Big G. Is the army crossing the river arriving first? That fort in the French and Indian war that is out in no-mans land is Fort Duquesne. I remember this very well because of how dumb I felt when I learned how to properly pronounce it. I was waaay off. Cardinal Ape wrote: Looking forward to the results of the battle against Big G. Is the army crossing the river arriving first? I'd sent it to cross over the Hudson the province above - means lower cohesion but also avoid the river crossing malus - so a bit of a trade off. ah the pictures are back ... update on the way ..
Ok, this is going to be confusing ... but I'll try to set it out as clearly as I can. The other part of the southern campaign also worked as 'the annoying American brigade in the south' got a beating. 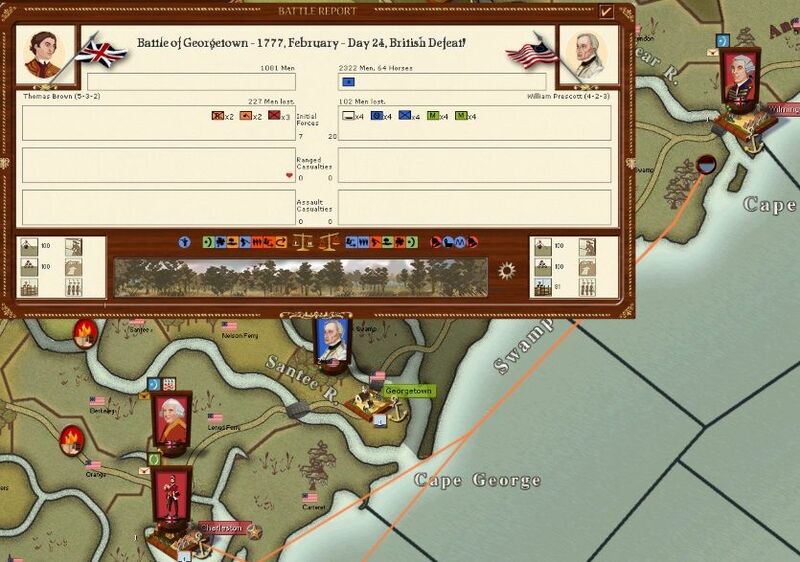 that isn't Washington – you can see Washington to the left hand side of the battle screen (more on this later). 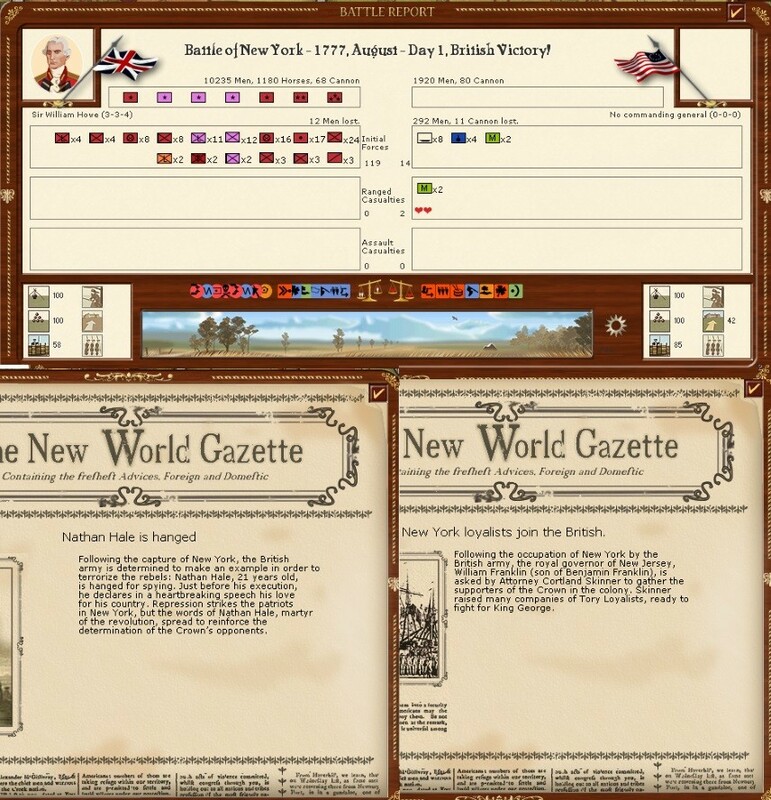 So what happened is by the time my two armies arrived in New York, Washington was gone (both had orders to move to the province not to target his army). Then Arnold wandered down from Albany and attacked Howe's wing of the army. 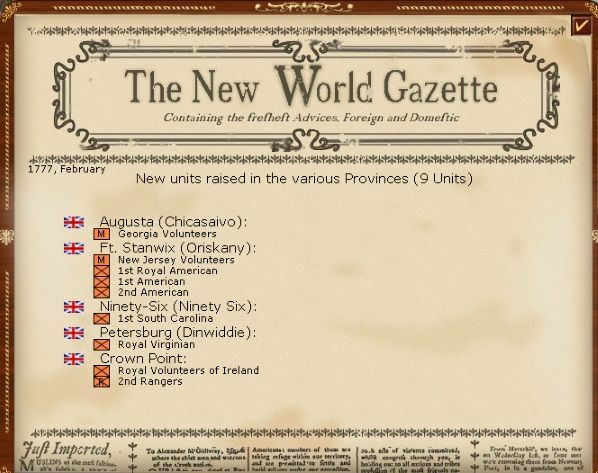 The numbers for both sides are vastly inflated as mine includes the Northern Army moving up from Philadelphia and the Americans also show the garrison in New York. The Scots word guddle was invented for situations like this. Anyway, more Americans opt for a world of orange tea. But of course what you really want to see is the area between Philadelphia and New York. My two main armies are in New York playing with Arnold. Wyoming is under siege and should be strormed next turn. Vigabrand clearly sent Washington the long way around (or he would have tangled with my Northern Army on the coast road). 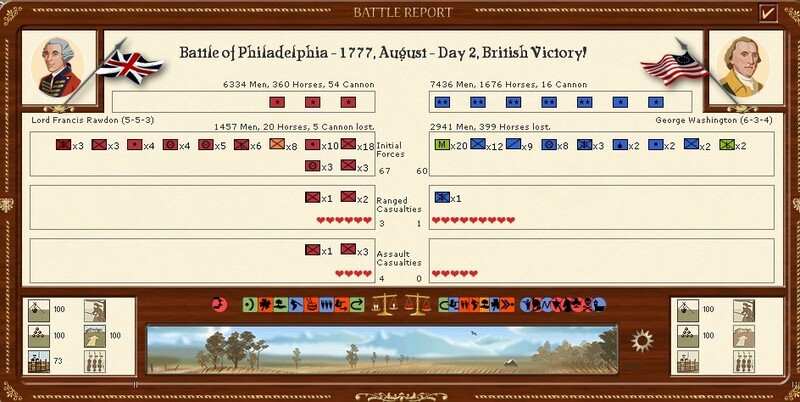 All that is left at Philadelphia is a small brigade – strong enough to beat that American army at Lancaster but far too weak to fight the Continental Army. Fortunately I have a solution. Erskine is ordered to go and die outside the city (if he does well we'll name a bridge after him). More importantly, I had two powerful forces sat in ports with fleets. They both sail to Philadelphia. 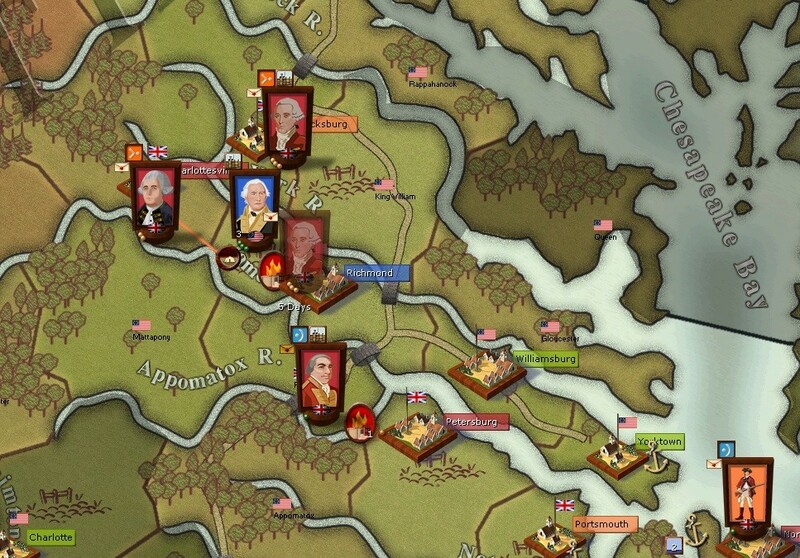 Given his supply problems, I don't think that Washington can manage a long siege (and I can resupply by sea) and that garrison is going to be far too strong to defeat. Everything else was a bit secondary. 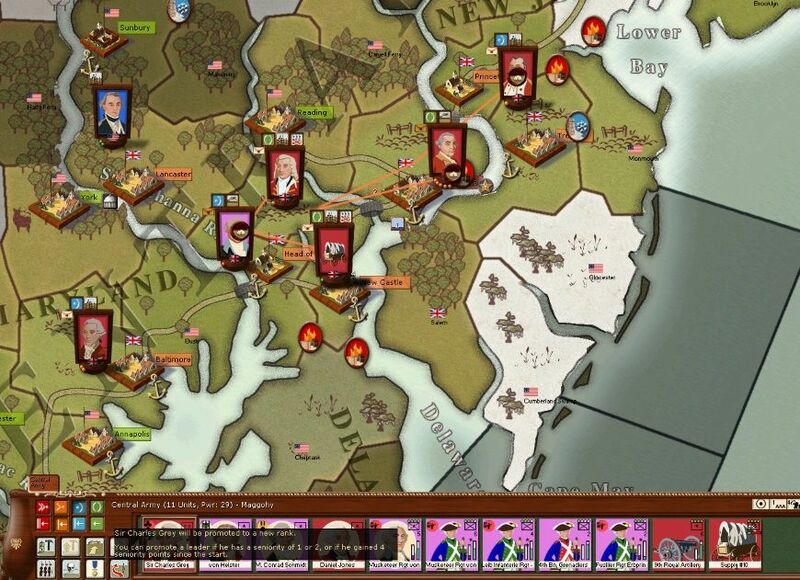 I've taken the city north of Richmond so decide to have one go at dislodging the Americans. So here is the vp situation. I should be able to take Wyoming next turn, a small army approaches Norwich. New York will still be a challenge but I want to drive Arnold off if I can. And next turn I move up to near Pittsburgh. Again I am doing short marches to retain cohesion but that brigade is a lot stronger than the American defenders. Would now be the appropriate time for Benedict Arnold to turncoat? It definitely looks like Philadelphia was Washington's intended target... I'd fear his possible return to New York. I think that is what I would do. Nice touch on the battle of the two Thomases. Cardinal Ape wrote: Would now be the appropriate time for Benedict Arnold to turncoat? I agree, its definitely time for Benedict Arnold to become an early hero in colonial America. I think vigabrand's move was astute but flawed. What really makes it a good move is that I had moved to New York and am now tangled up with Benedict. 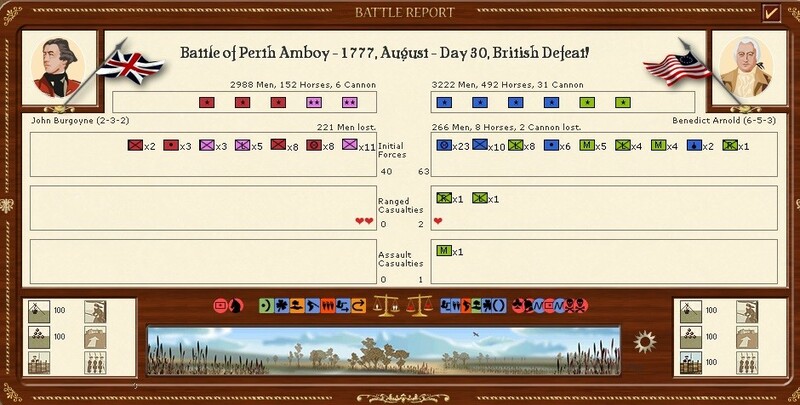 So the Continental Army is free to move/attack and I have nothing that can really beat it in open battle. His bad fortune was that I had 2 powerful brigades sat in ports with fleets and could divert them to Philadelphia. Having said that, I personally think he should have swung north. Defending New England would be tricky but there is a lot of supply and so on, really all he needs to do is to hold out till 1778? So we left at a moment of high drama. 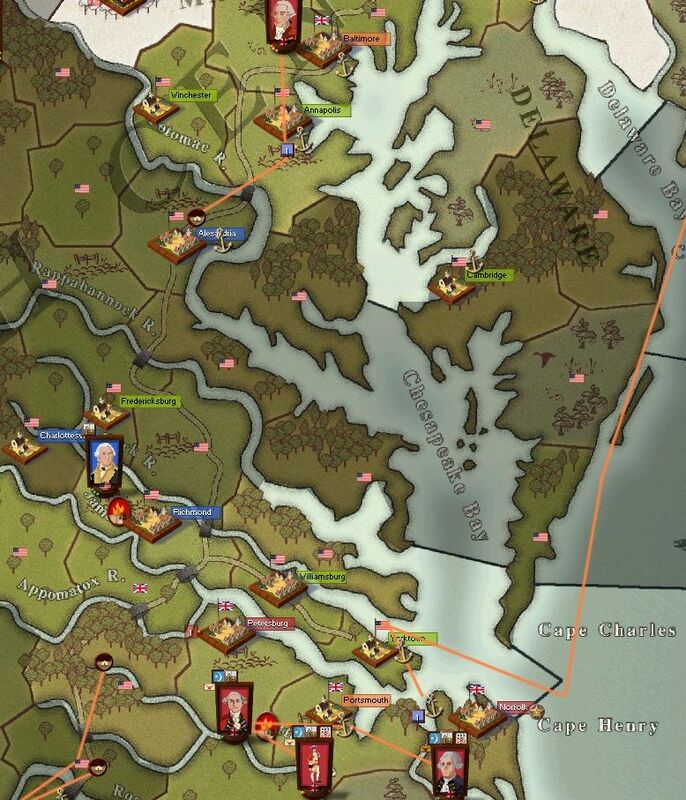 My two main armies are locked up in New York while Washington heads for Philadelphia and my seaborne reinforcements sail to the rescue. That army is now going to be in real trouble to find a base to recover cohesion, never mind supply. And at Philadelphia, Erskine did his job. Badly outnumbered, but that will stop Washington from being able to try and storm the town this turn. Not surprisingly, my attack on Richmond fails. 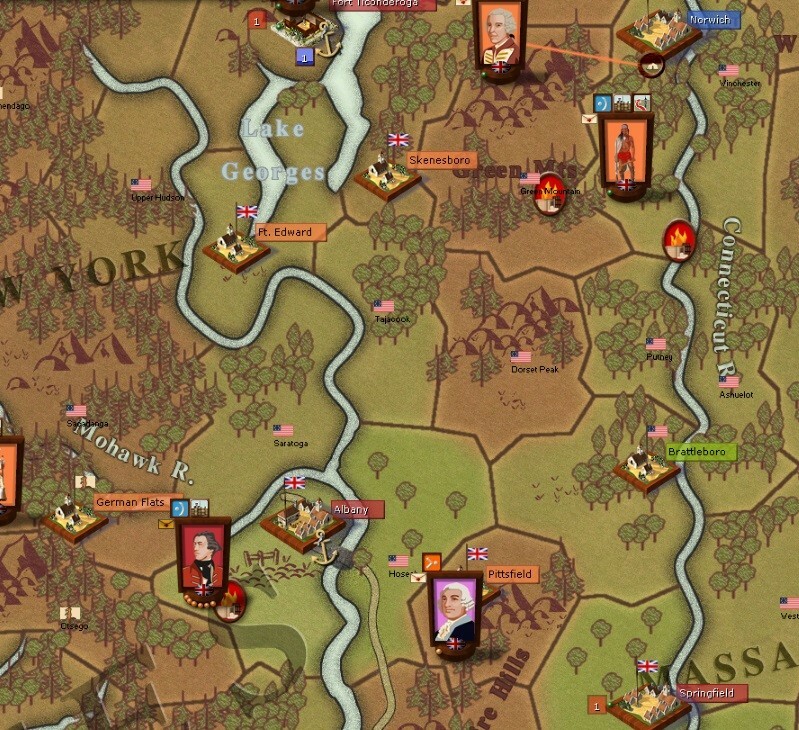 My problem here is I can screen the American force quite easily but its very hard to actually attack. Wyoming is now mine. 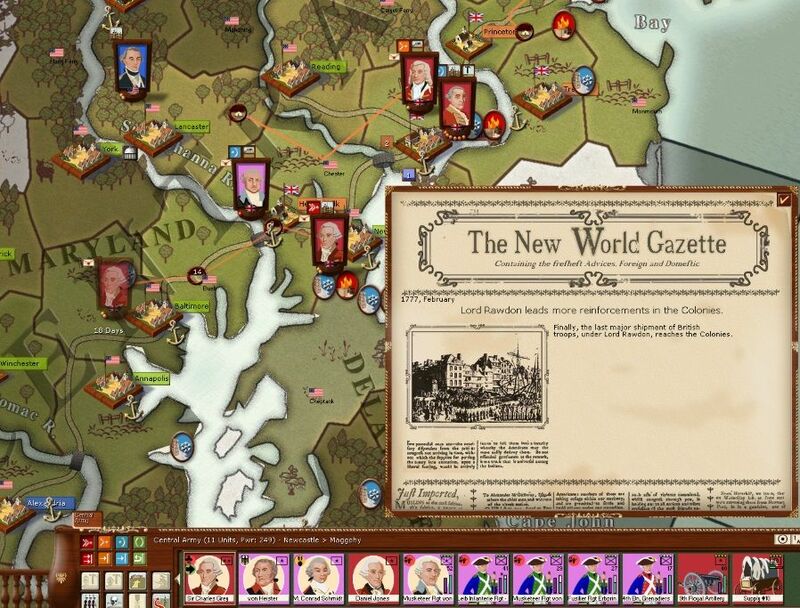 I have a large army in Philadelphia – all those green blobs. 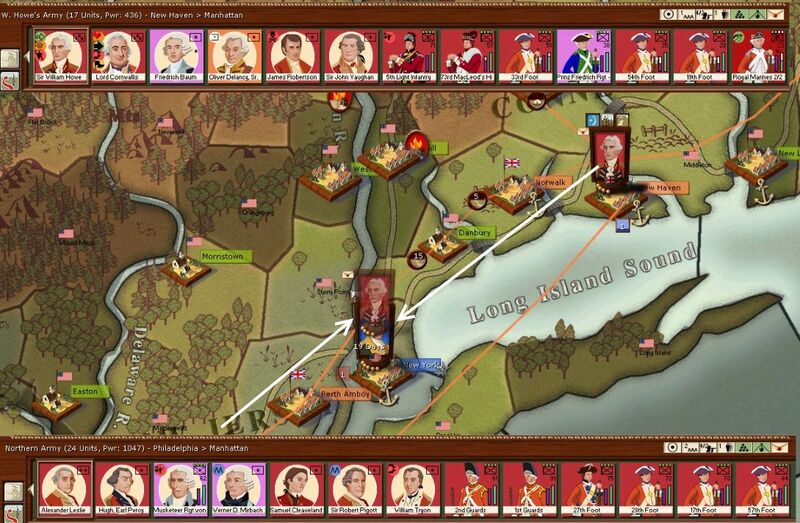 Arnold has retreated across the Hudson and I'll chase him with the stronger of my New York armies (and Burgoyne is moving down from Albany), The other army at New York will try to storm the city. I'm really not sure what Washington will do. He can't take Philadelphia and he must have supply problems. So one option would be to move south and see if the Americans can carve out an area of control in Virginia? VP situation looks interesting … I should take New York next turn. At the absolute worst case, I am building up a decent vp lead. A very interesting AAR loki, this (and praise from others) persuaded me to pick up this game, which I find very good with interesting gameplay. clandini5 wrote: A very interesting AAR loki, this (and praise from others) persuaded me to pick up this game, which I find very good with interesting gameplay. its a real classic. Lots of good history, both at the level of detail and the way it models the shifting dynamics of the wars in N America in this era. 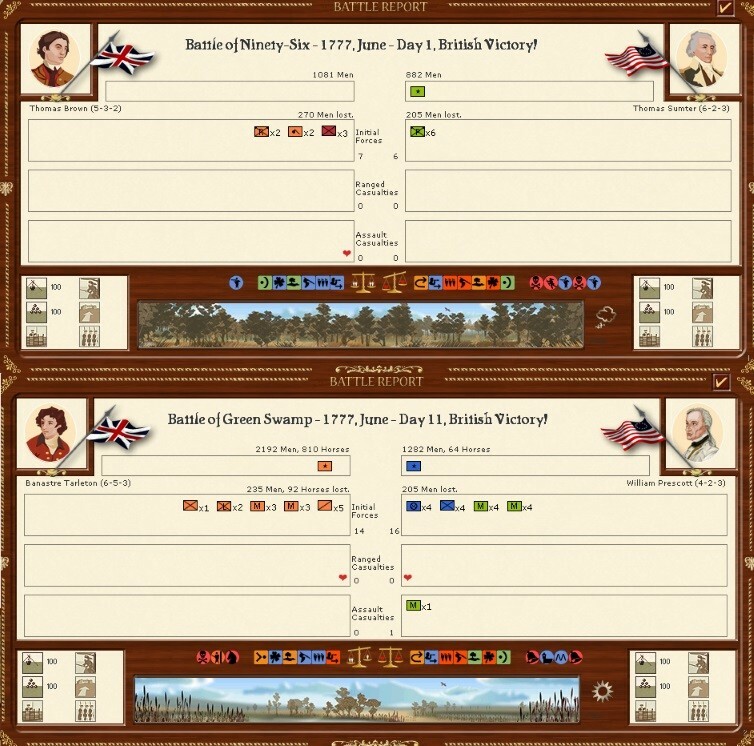 Great range of scenarios, some of the very early ones are really fun where a single battalion can be decisive and others best seen as a puzzle to solve from one side. But also, they really allow the players to let the game develop, superb for PBEM as they are so streamlined. If Pittsburgh is the big draw, then the British really have their American priorities messed up. Looks good, I believe. I know you say that the tide will turn against you once the French and other Continentals start messing with your policing actions, but for now you seem to be doing an excellent job keeping His Majesty's loyal subjects safe from the revolutionary rabble-rousers. 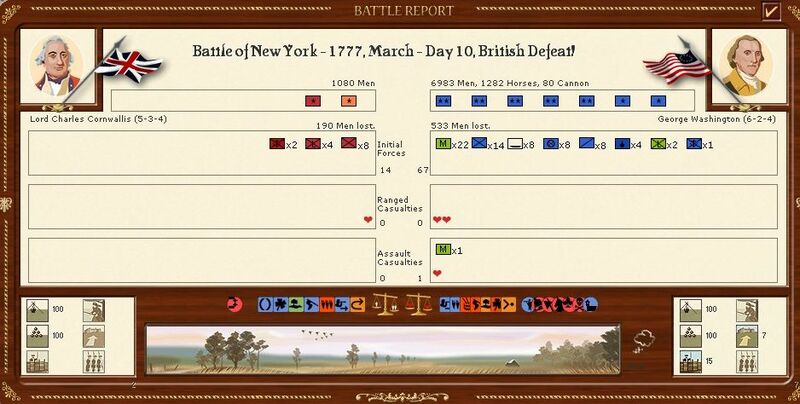 Looking forward to your triumphant entry into New York City next turn, but must admit to some trepidation caused by the rather large (and green-pipped) American armies in Pennsylvania. Stuyvesant wrote: If Pittsburgh is the big draw, then the British really have their American priorities messed up. Pittsburgh is clearly like a town in central Scotland (Falkirk) where popular opinion acknowledges its not quite the end of the world but that you can see it from there? And run away at Philadelphia. Here I'd gambled on attacking out of the fort – not usually a good idea and I paid a high price for it. 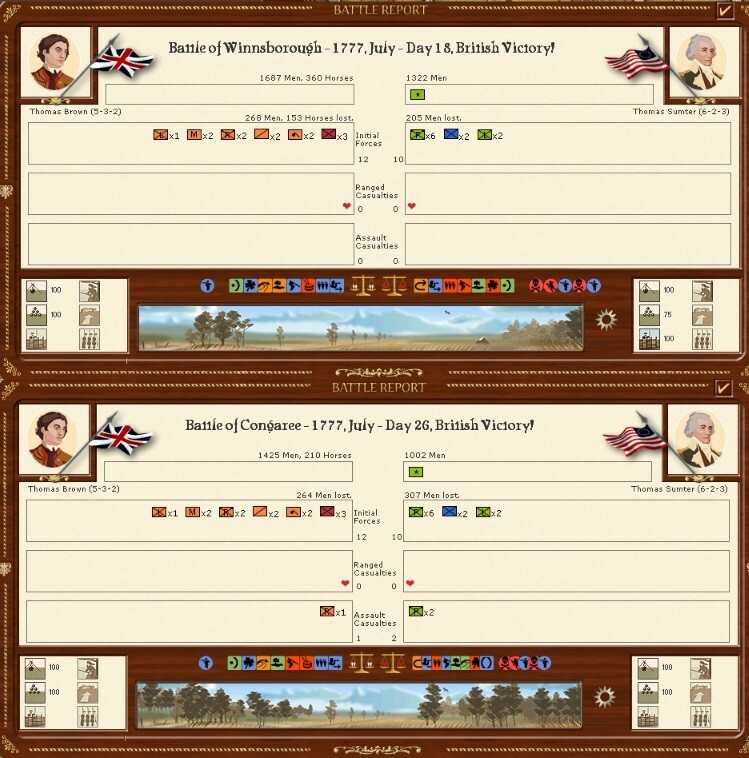 I wanted to stop Washington moving as he wished and felt that a battle (won or lost) would reduce his scope for movement. ... we actually played on a couple more turns to see if the victory screen appeared (it didn't). Then had a chat about how feasible/interesting it was to carry on. Vigabrand now has massive supply problems affecting both his main armies and while he could break them down to fight a guerilla style war did not want to carry on (which I can understand). So, there we are, America is safe, will pay its taxes (at the special rates agreed by HMRC) and is condemned to a future where tea is orange coloured. As ever, thanks to all readers and commentators .. hope you've enjoyed this. It certainly reminded me of just how much great fun WiA offers, especially PBEM. In reality I am taking a break from work, sitting here reading this with a cup of coffee. My name is Nathan H***. My mind plays a trick on me; for a split-second I think I've been hanged! While it is a bit hokey, it seems appropriate to end with Eneas Munson's "To the Memory of Capt. Nathan Hale". My soul shall join the assemblies of the just. its always a good idea to remember the harsh realities of the various wars we replay. When I was studying early modern history (so in European terms roughly from the end of the 30 years war to the French revolution), naturally the whole issue of why the American colonies revolted came up. Lots of erudite reasons connected with tax, representation, the fall out from France's defeat in the Seven Years War etc. But our prof essentially argued it happened because N America had become mature enough and self-centred (I mean that in a good way) that remaining part of a distant power with different goals and aims simply no longer made sense to many people. I think that Hale's speech essentially captures that mindset. Well, I didn't expect that! Looks like you broke the back of the Revolution, even if long-term its prospects were still quite good, with the intervention of the Continentals. Then again, would France really have gone to war with the British if the Union Jack had been flying from every major city in the Colonies? Can certainly understand from a gameplay point of view that having to claw back from the near-abyss that the Americans find themselves in, is not a very appealing proposition. Thanks for playing and writing. In the end, it feels a bit like the American Revolution in reverse: there wasn't any single decisive defeat, but there were enough defeats that in the end it just wasn't worth it to keep fighting. 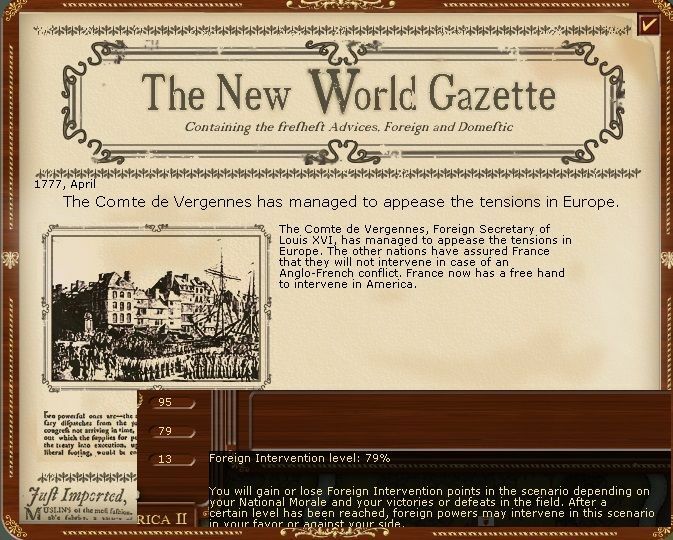 it was a bit sudden, I started the summer campaign hoping to set up a nice positive flow of VPs to see me over the end-game and perhaps weaken the American army to the point where I could contest the French/Spanish/Dutch hordes heading my way. I guess in terms of wider politics, any European power now looking for a war in America has the problem of the Royal Navy unchallenged at sea and a worse version of my early game problem of securing a port large enough to supply a large army. 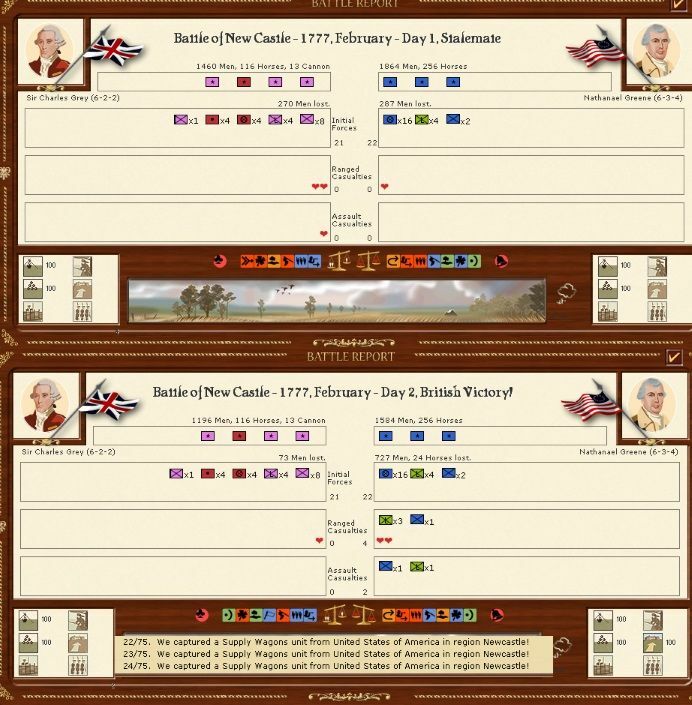 Oddly the only individually decisive battle was my defeat at Boston - I've never seen that sort of NM shift in WiA before. Beyond that the relatively low number of units and the WiA replacement system does mean you tend to a series of clashes that protect/capture key provinces but the two armies remain pretty much intact. Great job loki! It was good fun following this as with all your other AAR's. Hope that you continue to do these in the future! Cheers.